I can almost guarantee that anytime I discuss with a woman exercise and her fitness goals that she will state the following somewhere in or near the first sentence: "I want to look like a dancer." And I can pretty much also guarantee that at least one of the following phrases will turn up not too far from that first: "firm and tone," "long and lean," "shape and lengthen," and "not get bulky." The near universal desire among women to achieve the sinewy and lithe look of many professional dancers, coupled with an equal fear of "getting huge" from lifting heavy weights, has unfortunately led too many women to struggle with ineffective fitness programs. The fitness industry itself is much to blame for this situation. Seeking to capitalize on a public's desire to look like a dancer it pushes countless training methods which promise to "firm, tone, shape and lengthen" both without lifting heavy weights or expending great effort. "And why should you," the thought goes, "you don't want to get big muscles. And besides, dancers don't lift heavy weights." So the marketplace becomes flooded with toning exercises, and shaping exercises, and lengthening exercises, etc. In pursuit of the dancer-like physique there lives a common fear that lifting anything but light weights will build large, short and bulky muscles. And it is upon this fear that the whole muscle-lengthening, shaping, and toning ideology builds its home (interestingly a fear also fueled by this ideology). Watch any infomercial, read any of a number of magazine articles or books, and you will be sold on some gizmo or exercise program that promises to sculpt and lengthen your muscles without adding muscle bulk. On the surface it would seem logical simply to do what dancers do if you want to look like one, until you consider the fact that professional dancers have a genetic predisposition towards a body type suited for dance, including good bone structure, decent muscularity, and a natural leanness; until you consider that dancers do not train as they do in order to look good but rather to improve their dance ability; and until you further consider the experience of thousands of other dancers who follow the same routines and prescribe to the same practices yet do not come close to looking the same way. * that there are special "toning" exercises… there aren't. In addressing these perceptions I hope to impress upon you that an effective training program is rooted in quite the opposite practice: that using basic exercises to lift substantially heavier weights is required to mold and trim the body into the physique that you are seeking. In a follow-up article I will provide more information on that type of program, but for now I hope that the information I provide here will at least nudge you in that direction and start saving you from countless hours of performing exercises that will essentially amount to little at best. You get your shape from your skeletal structure, muscles, and fat. It should be obvious you cannot change your skeletal structure without breaking bones. Your structure is your structure, period. Similarly, you cannot lengthen muscles! A muscle is attached to a bone on one end, crosses a joint or joints, and attaches to another bone at its other end. The muscle's length is fixed between these two points, and no matter what you do and no matter how you exercise or how hard you try you cannot lengthen this muscle without lengthening the bones to which it is attached, which as you know cannot be done without breaking them. Muscles cannot be lengthened, again period. Well, perhaps one cannot literally lengthen her muscles, but can't she shape her muscles to achieve the illusion of length or at least sculpt them into a more exquisite shape? According to the toning camp, this can accomplished through "toning" exercises which utilize training with weights light enough to avoid gaining muscle bulk, yet which somehow provide just the right type or volume of stimulation to nurture in the muscle a beautifully sculpted contour and just the right amount of… tone. Let me clarify that I have absolutely nothing against shaping/toning exercises because they emphasize the use of light weights-although it makes more sense to me to simply call this light resistance training-but I do take issue with the claims made for the exercises, that through toning exercises you can somehow affect the physical shape of your muscle without growing it (except perhaps to lengthen it as previously mentioned). Consider the physiology of a muscle: when an exercise repeatedly demands a muscle to overcome a load of enough magnitude, such as when you lift a heavy weight, over time the muscle will adapt to the stimulus by getting stronger and possibly larger, until the time that it can handle the load more capably. Once the muscle can comfortably manage that load, it will adapt no further until greater demands are placed on it, such as when the load is increased even more. Yet if the load is light and remains light, as is the prescription for toning exercises, little adaptation, if any, will occur because the muscle can already cope with the load. It is true that the high repetition training often used in toning exercises can elicit muscular adaptation, but not the adaptation that it claims, which is to shape and/or lengthen muscle. The muscle will only improve in its ability to perform more and more repetitions-in muscular endurance, as it is known-but not grow or change its shape in any way. But more to the point, all muscles have shape to begin with, a predetermined size and shape depending on your genetics and underlying skeletal structure, which also is a factor of genetics, and all a muscle can do with regard to this shape is either grow in response to progressively increased loads or shrink through lack of use or malnourishment. It cannot be shaped in any other way. As it grows it becomes more "shaped," and as it shrinks it becomes less "shaped." So if you want to shape a muscle you basically have a few options: grow the muscle through training with resistance heavy enough to induce muscular growth; reveal the muscle's inherent shape by decreasing the amount of fat between it and the skin; or a combination of the two. So what about this third component of your physique, fat, the first being your skeletal structure and the second being your muscles? As I am sure you know, stores of fat lie between the muscles and skin. If you reduce the fat, not only will the inherent shape of your muscles begin to show, but also you will appear physically longer as the girth of your body and limbs is reduced relative to your height. Your muscle mass, as you may or may not know, is central in the fight against excess body fat. Your muscles are sort of like your body's furnace, continually burning calories while you eat, sleep and play. Therefore, if you increase your muscle mass, you will increase the rate at which your body burns calories-even while you rest-and thus decrease body fat. Yes, you will add some muscular size in the process, but muscle takes up less space than fat, so although you do gain muscle this gain is offset by an even greater loss in fat volume, the result being a thinner and leaner you. Furthermore, the additional muscle, especially when you lose fat, will only help cultivate the sculpted look you seek. Add to this the fact that as you age you naturally lose muscle mass, and the necessity to regain and maintain muscle becomes even more apparent. So increasing muscle is, as you can see, of great importance in pursuit of the dancer's physique. Unfortunately, trying to increase muscle mass through toning exercises is almost a complete waste of your time since they elicit little muscle growth. The only way they can perhaps be of value, in the fight against fat that is, is if they are done in such volume and at such intensity that the workout effectively becomes aerobic, and as a consequence you burn a lot of calories during the workout. On the other hand, training with moderate to heavy resistance and progressively increasing the load that the muscles must bear is, without doubt, how to gain muscle. In response to the physical stress, your nervous system will attempt to cope by improving its ability to recruit muscle fibers while the size of the muscle fibers themselves will increase in order to provide for a stronger contraction. Light resistance training, or toning, does not do this. A simple understanding of anatomy and physiology should be enough to dispel claims about shaping and lengthening muscles. You cannot shape muscles, and you cannot lengthen them. Next time you hear such a claim be extremely skeptical as to that authority's knowledge or integrity-unless you are sure they are talking about something else. Light resistance exercise, as it should be called, can find its proper place in any fitness program, but shaping, lengthening, or even growing a muscle is not one of them. The bottom line really is the same for all of us, whether you are overweight, underweight, or at a good weight but still want to improve your figure. If you want to be lean, fit, healthy, and sculpted, you need to gain, regain, or maintain muscle mass and reduce or control your fat levels. This is best accomplished with basic exercises that utilize large muscle groups to lift substantial amounts of weight. It will rev up your metabolism, and you'll burn more calories as you go about your daily life. Add to this moderate aerobic exercise and a healthy diet, and you will get lean and shapely and live in a body with which you can be happy. One final note: I know that there will continue to be those who won't follow this advice out of fear of getting big and bulky. Don't you be one of them. Without a genetic predisposition to grow large muscles and perhaps the aid of drugs and/or male hormones, it is very, very difficult for women to gain a lot muscle. It is even difficult for many men to gain a lot of muscle without making special efforts. So don't let that fear be an impediment to adopting a good physical training program. And hey, you can always go back to those toning exercises if you really want. Donny Schreier is a personal trainer in New York City. If you have any questions regarding this article, please email them to him at info@donnyphysicaltraining.com. Donny also is available for personal training, and he is launching an online physical fitness training and education website later this summer. 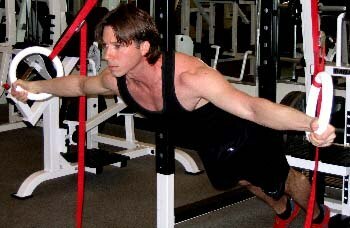 Please visit http://www.donnyphysicaltraining.com for more information.